President Kennedy and California governor Pat Brown, 7 November 1962, discussing Brown’s defeat of Nixon in the 1962 CA gubernatorial race and Nixon’s infamous post-defeat press conference. The original of the tape frequently skips. President Kennedy: . . . do it in 1960. Hell, I’d gotten them all in shape, so that . . . [Needle skips.] Huh? President Kennedy: I’ll tell you this—you just reduced him to the nut house. President Kennedy: [chuckling] I understand. But God, that last farewell speech of his . . .
President Kennedy: Well, no, but it shows . . . [Needle skips.] What’s going to happen out there? Brown: I don’t see how he can ever recover. [He lost] the leaders. Brown: [Former senator] Goodwin Knight walked out on him; [California conservative leader] Joe Shell told me he walked out on him. This is a peculiar fellow. I really think he’s psychotic. He’s an able man, but he’s nuts. Brown: Like a lot of these paranoics. But . 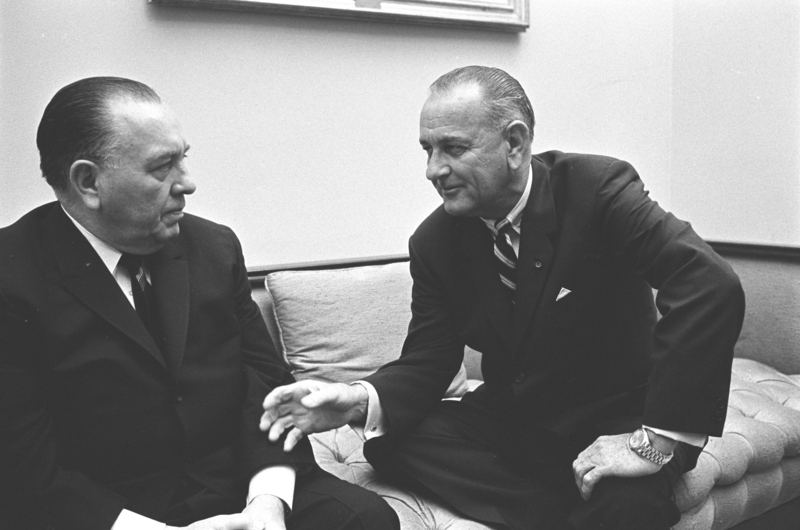 . .
LBJ and Senate minority leader Everett Dirksen, discussing reports of Nixon operatives negotiating behind the scenes with the S. Vietnamese government to discourage a pre-election peace settlement. President Johnson: [with Dirksen assenting] Now, I can identify ‘em, because I know who’s doing this. I don’t want to identify it. I think it would shock America if a principal candidate was playing with a source like this on a matter this important. I don’t want to do that. But if they’re going to put this kind of stuff out, they ought to know that we know what they’re doing. I know who they’re talking to, and I know what they’re saying. Well, now, what do you think we ought to do about it? Dirksen: Well, I better get in touch with him [Nixon], I think, and tell him about it. President Johnson: I think you better tell him that his people are saying to these folks that they oughtn’t to go through with this meeting [in Paris]. Now, if they don’t go through with the meeting, it’s not going to be me that’s hurt. I think it’s going to be whoever’s elected. President Johnson: And I think they’re making a very serious mistake. And I don’t want to say this. President Johnson: Well, I don’t know who it is that’s with Nixon. It may be [Wisconsin congressman Mel] Laird. It may be [aide Bryce] Harlow. It may be [campaign manager John] Mitchell. I don’t know who it is. President Johnson: [with Dirksen assenting] Now, I don’t want to say you, and you’re the only man that I have enough confidence in to tell ‘em. But you better tell ‘em they better quit playing with it. You just tell ‘em that their people are messing around in this thing, and if they don’t want it on the front pages, they better quit it. Nixon and White House aide Bob Haldeman, after the 1972 election, discussing whether the “hardhat” voters can be permanently wooed to the GOP. Bob Haldeman: And [Labor Secretary-designate Peter] Brennan has gotten the damndest press reaction, Mr. President, and the damndest fan mail . . .
Haldeman: Oh, it’s incredible. You mean, letters—he brought in some of ‘em to me. There’s letters from people saying, “Well, we weren’t really sure—we voted for Nixon, we weren’t really sure. But now we are. He does believe in the working man, and he’s . . .” You know, I think this has really had a . . .
President Nixon: You mean, the idea, they finally think–the appointment of a working man makes ‘em think we’re for the working man, isn’t that it? Haldeman: Yeah. That’s precisely it. President Nixon: You talk about all the tokenism. We appoint blacks and they don’t think you’re for blacks. President Nixon: And [you appoint] Mexicans, they don’t think you’re for Mexicans. But a working man, by golly, that is really something. Haldeman: —they put in as the [Democratic] party chairman, the fundamental dichotomy, or the fundamental cleavage, within the Democratic Party is such that, with what you’re doing to build the new majority, and what I hope to help you doing, I think we’re going to keep them split, and . . .
Haldeman: —choices of the people. They may not ever become Republicans, but they’re Nixon’s. Haldeman: If there’s some way to perpetuate that, I don’t know.